Last year I was doing a lot of adjudicating, writing sheet after sheet of comments. I found myself running out of ideas for different ways to say the same thing. One day, it occurred to me that if I had a list of interesting words with me, I might write more interesting comments. I compiled this list of words that thought i'd find useful and guess what? They were! I take them with me now when i need to judge somewhere. Sometimes just having a list of interesting words perks up my writing. They're useful to look at sometimes during a particularly grueling afternoon of teaching. I was reading Norman Krieger's Facebook post about having to write endless recommendation letters and thought, "I bet he wishes he had my word list." This one's for you, Norman. It may be too late for this year, but maybe it will help next! I love the book, Mindset: The New Psychology of Success by Carol Dweck. It is a wonderful resource for teachers of any subject. According to Dweck, individuals can be placed on a continuum according to their implicit views of where ability comes from. Some believe their success is based on innate ability; these are said to have a "fixed" theory of intelligence (fixed mindset). Others, who believe their success is based on having opposite mind set, which involves hard work,learning, training and doggedness are said to have a "growth" or an "incremental" theory of intelligence (growth mindset). Individuals may not necessarily be aware of their own mindset, but their mindset can still be discerned based on their behavior. It is especially evident in their reaction to failure. 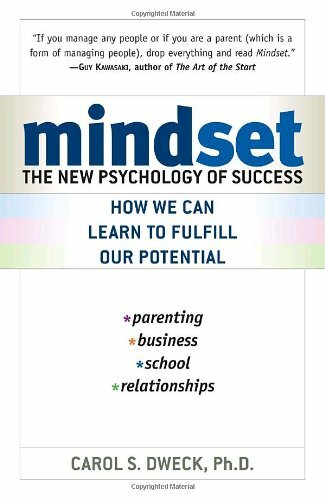 Fixed-mindset individuals dread failure because it is a negative statement on their basic abilities, while growth mindset individuals don't mind or fear failure as much because they realize their performance can be improved and learning comes from failure. These two mindsets play an important role in all aspects of a person's life. Dweck argues that the growth mindset will allow a person to live a less stressful and more successful life. I have found this book to be very helpful when I encounter anyone (parent or child) who believes that intelligence and ability are innate and have nothing to do with hard work. It's one of those books that I keep buying over and over because I loan my copy or just give it to a parent I think needs to read it.